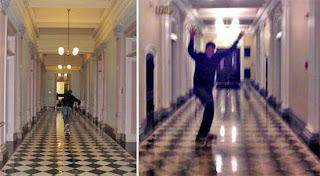 If you're one of those people who think that PRESIDENT OBAMA and his family are NOT maintaining the integrity of the White House, these pictures of TONY HAWK skateboarding through one of its hallways probably won't make you happy . . .
All the AGONIZING speculation is over: T.R. KNIGHT has FINALLY issued a statement announcing that he IS leaving "Grey's Anatomy". He says, "Leaving 'Grey's Anatomy' was not an easy decision for me to make. I am extremely grateful to have had the opportunity to play this character and will miss my fellow cast and crew very much. -"I continue to wish them the very best, and wholeheartedly thank all of the fans who have supported me and the show with such passion and enthusiasm." The show's creator, SHONDA RHIMES, also released a statement . . . saying, "I think I speak for the entire 'Grey's Anatomy' family when I say we wish T.R. Knight the best in his future endeavors. -"He is an incredibly talented actor and a person whose strength of character is admired by all of us." Not surprisingly, Rhimes did not provide any details on what will happen to T.R. 's character, George O'Malley . . . not that it's all that much of a mystery. On the season finale, George was left on the BRINK of death . . . so he probably isn't surviving. "People" magazine is reporting that a rep from ABC has confirmed that Katherine will be back . . . along with JESSICA CAPSHAW, who plays Dr. Arizona Robbins. In 2005, a 6-year-old girl named Colby Curtin from Huntington Beach, California was diagnosed with vascular cancer, and over the past few years, her condition kept getting worse. But before she died, Colby's final wish was to watch that new Pixar movie "Up". Unfortunately, by the time the movie was released, Colby was too sick to go to the theater. So a family friend contacted Pixar . . . and on Friday, a Pixar employee delivered a DVD copy of "Up" to Colby's house. Later that night, after watching the movie . . . Colby (--who was 10 years old) passed away.